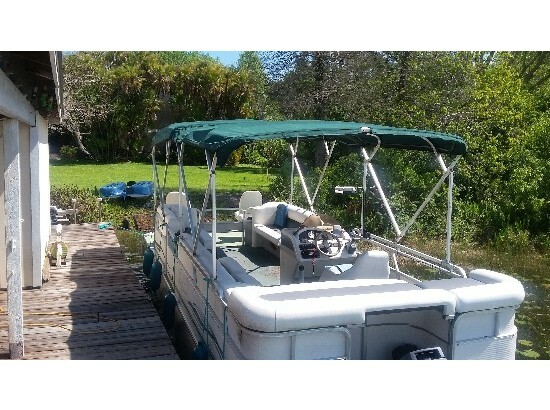 2009 Sylvan SUN CHASER 2009 Sylvan 20’ Sun Chaser powered with a 2006 Mercury 50 hp 2 stroke. Includes Magic Tilt trailer, new Bimini and a Jensen AM/FM stereo. 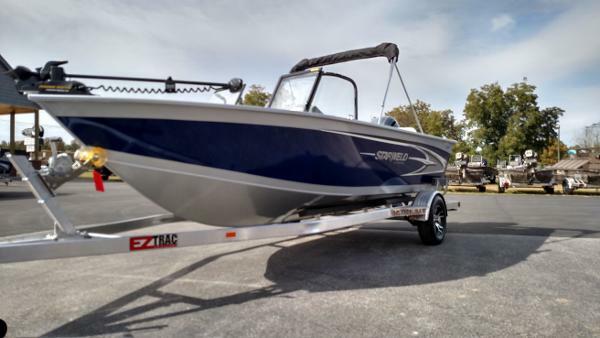 2017 Starweld 1600 SC 2017 Starweld 1600 SC w/Yamaha 90 The NEW 2017 Starweld 1600 series with the Highly Fuel-Efficient Yamaha 90hp 4-Stroke and the Plush, Euro Tuck and Roll Premium Package. On the spot financing with rates as low as 2.99% APR for up to 180 months (wac). This is L U X U R I O U S style with High Performance Loaded with luxurious amenities and spacious interiors, this is the perfect fishin rig.. The Starweld boat by Starcraft offers plenty of details to impress. 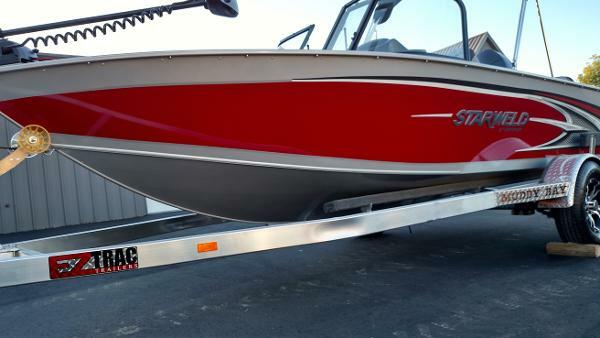 Starweld 1600 SC model Includes * Full Guage Package * 25 Gallon Bow livewell * 12v Power point * Bow Trolling motor plug * Fishing seats * Lifetime Warranty on Welded Seams * Silver Metallic Paint w/ Red Stripe * Minkotta 45LB thrust Edge * Hummingbird Piranahmax 175 * 12 Gallon Bow Livewell * StarCraft's Legendary LIFETIME + 6 Warranty. Muddy Bay® Marine is your Southeastern Boating Headquarters. Get your Starcraft Pontoon, Sun Chaser Pontoon, Sylvan Pontoon, Veranda Pontoon, War Eagle, Xpress, Excel, Gator-Trax, Gator-Tail, Pro-Drive, Phowler, Stumpjumper, Excel F4 and F86, DuraCraft, Havoc, Alweld, StarCraft, Starweld, Sea Ark, Mi-Tide, Phowler, or Triton, and be on the water TODAY! 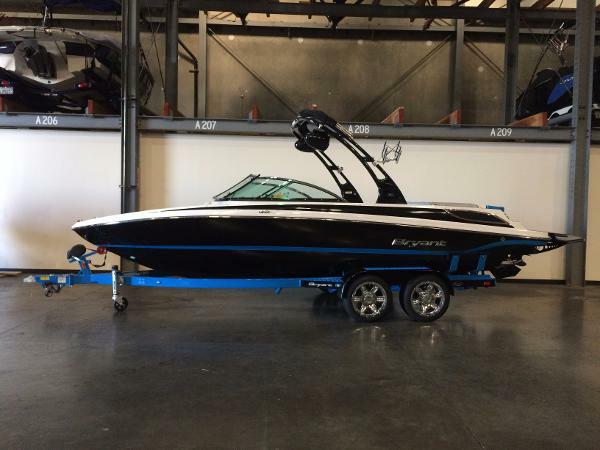 Muddy Bay® Marine is a large stocking marine dealer located here in Newberry, SC with over 175+ boats in inventory, in all the different models. Mud Motor or Outboard, we stock over 250+ motors! No waiting and no special orders needed! Yamaha, Honda, Mercury, Tohatsu, or Evinrude E-Tec Outboards OR Gator-Tail, Pro-Drive, BOSS Drive, Mud Buddy, or Copperhead Mud Motor Also, keep in mind that Muddy Bay® Marine GUARANTEES the Lowest Price on all our lines of Boats. I will be happy to answer any questions about pricing, features, options or helping you find the best boat that suits what you are looking for and get you on the water with no waiting and in-house financing. 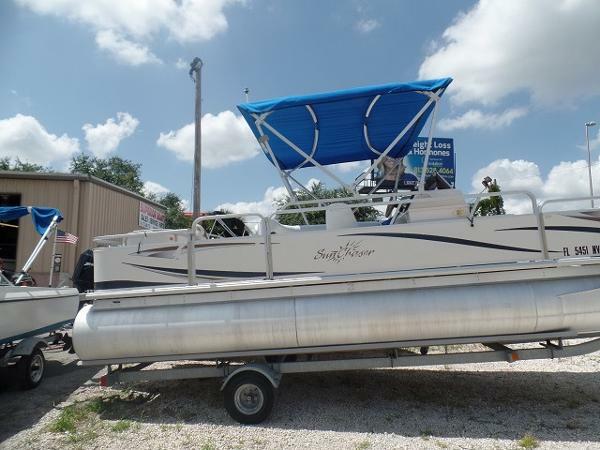 MUDDY BAY® MARINE13803 CR Koon Hwy. 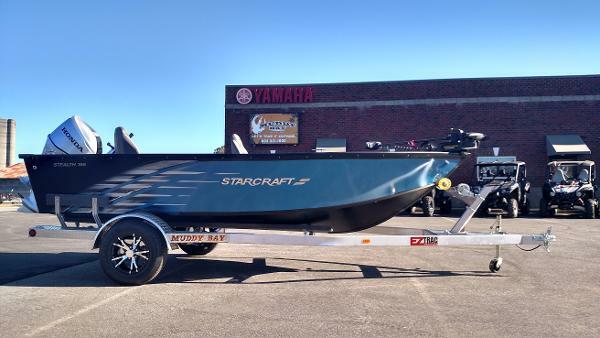 Newberry, SC 29108 The Starweld 1600 SC welded fishing boat gets you out fishing in comfort for less. It features 6 seat bases for maximum versatility, a 25-gallon aerated livewell and secure rod storage. 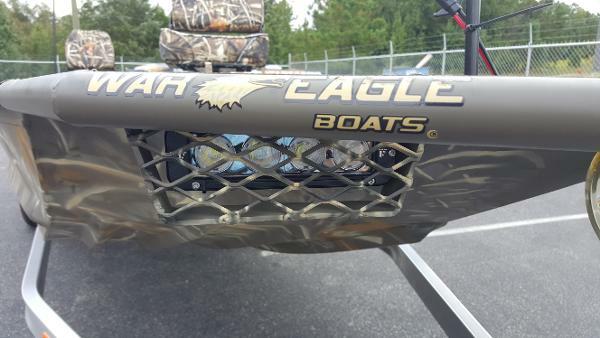 2016 War Eagle 754 LDV Ducks Unlimited Edition ????? War Eagle 754 LDV Max-4 Duck Boat War Eagle 754 LDV Duck Boat. This Official DUCKS UNLIMITED Edition model from War Eagle Boats, the 754 LDV DU Edition Duck Boat. This War Eagle 754 LDV (Ducks Unlimited Edition) is the perfect hunting & fishing rig for even the most frugal Duck Hunter!. Equipped with a Yamaha 4-stroke and custom Drive-on Trailer, this is the Official DUCKS UNLIMITED EDITION! 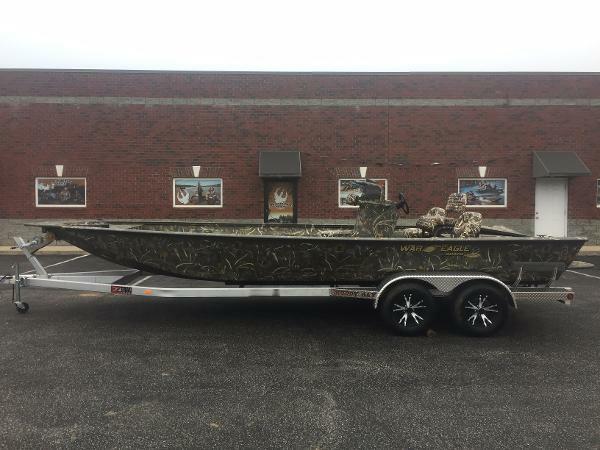 *** This War Eagle 754 LDV Ducks Unlimited Edition is LOADED, T O U G H and ready for action: War Eagle 754 LDV Duck Boat * Full RealTree Max-4 Camo Package * Duckbill Option with 4 LED Rainbow Lights * Linex Spray-in Liner * Treadplate floor * Gunnels with T-rail System * Front deck storage * Hinged-rear lid / fuel tank cover * Rear SeatTrack Adapter * Front Deck Seat Base * Full center keel * All Welded Construction *Level foam flotation * Official D U C K S U N L I M I T E D Edition Custom Drive-on Trailer * Side Guide Package * Marine Light Package * HD Wheel Fenders Ready for your choice of Yamaha, Honda, Mercury, Evinrude, or Tohatsu outboard, OR Pro-Drive, Gator-Tail, Boss Drive, or Mud Buddy Mud Motor! * Outboard or Mud Propeller * Interstate Marine Battery * And so much more! This is one T O U G H Boat! Just add freight, prep., and rigging, and get one one of the best deals on the water. This deal is hard to beat. *** On the spot financing with rates as low as 2.99% APR for up to 180 months (wac). 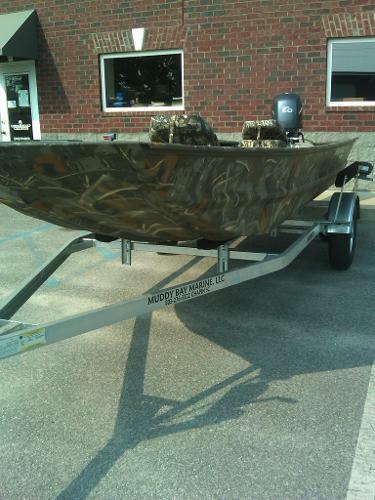 *** Muddy Bay Marine is your Southeastern Hunting & Fishing Boat Headquarters. Get your custom War Eagle, Xpress, Excel F4 and F86, DuraCraft, Pro Drive, Gator Tail, Gator Trax, Havoc, Alweld, StarCraft, Starweld, Sea Ark, Mi-Tide, Triton, Veranda Pontoon, Sylvan Pontoon, Sun Chaser Pontoon, or StarCraft Pontoon and be on the water TODAY! Muddy Bay Marine is a large stocking marine dealer located here in Newberry, SC with over 150+ hunting and fishing boats in inventory, in all the different models. * * Also, keep in mind that Muddy Bay Marine GUARANTEES the Lowest Price on all our lines of Boats. * * I will be happy to answer any questions about pricing, features, options or helping you find the best boat that suits what you are looking for and get you on the water with no waiting and in-house financing. I hope you will let me earn business and show you the best service available!. 2016 War Eagle 542 FLD War Eagle 542 FLD Duck Boat in Mossy Oak Shadowgrass Camo War Eagle 542 FLD Duck Boat. This #1 selling duck boat model from War Eagle Boats. 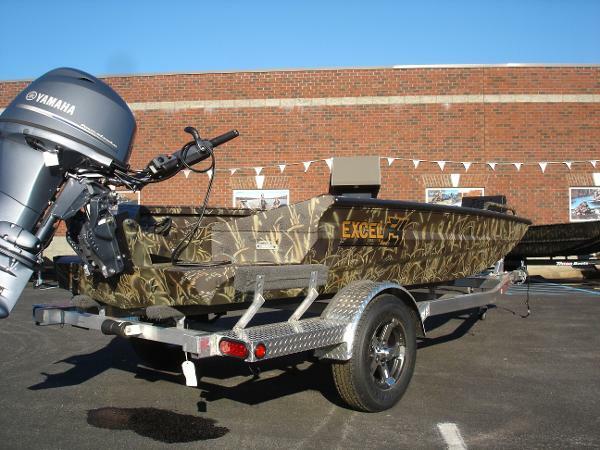 This War Eagle 542 FLD is the perfect hunting & fishing rig for even the most frugal Duck Hunter!. Equipped with custom galvanized Drive-on Trailer, this is the Official Duck Boat of serious hunters! *** This War Eagle 542 FLD is LOADED, T O U G H and ready for action: War Eagle 648 LDV Duck Boat * Full Mossy Oak Shadowgrass Camo Package * Diamondplate Treadplate floor * HD Gunnels with T-rail System *Hinged-rear lid / fuel tank cover * Rear SeatTrack Adapter * Front Deck Seat Base * Custom War Eagle Mossy Oak Shadowgrass Camo Swivel Seat * Custom War Eagle Mossy Oak Shadowgrass Camo Fishing Seat * Spider-rig pole Extension * Full Navigational Package * Full center keel * 20 inch Transom * All Welded Construction * Full foam flotation *Custom Drive-on Trailer * Side Guide Package * HD Wheel Fenders Ready for your choice of power from Yamaha, Honda, Mercury, Evinrude, or Tohatsu outboard, OR Pro-Drive, Gator-Tail, Boss Drive, or Mud Buddy Mud Motor! * Outboard or Mud Propeller * Interstate Marine Battery * And so much more! This is one T O U G H Boat! Just add freight, prep., and rigging, and get one one of the best deals on the water. This deal is hard to beat. *** On the spot financing with rates as low as 2.99% APR for up to 180 months (wac). *** Muddy Bay Marine is your Southeastern Hunting & Fishing Boat Headquarters. Get your custom War Eagle, Xpress, Excel F4 and F86, DuraCraft, Pro Drive, Gator Tail, Gator Trax, Havoc, Alweld, StarCraft, Starweld, Sea Ark, Mi-Tide, Triton, Veranda Pontoon, Sylvan Pontoon, Sun Chaser Pontoon, or StarCraft Pontoon and be on the water TODAY! Muddy Bay Marine is a large stocking marine dealer located here in Newberry, SC with over 135+ hunting and fishing boats in inventory, in all the different models. * * Also, keep in mind that Muddy Bay Marine GUARANTEES the Lowest Price on all our lines of Boats. * * I will be happy to answer any questions about pricing, features, options or helping you find the best boat that suits what you are looking for and get you on the water with no waiting and in-house financing. I hope you will let me earn business and show you the best service available!. GUARANTEED LOWEST PRICES ON ALL WAR EAGLE BOATS! 2016 War Eagle 648 LDV ????? 2015 War Eagle 648 LDV Max-4 Duck Boat War Eagle 648 LDV Duck Boat. 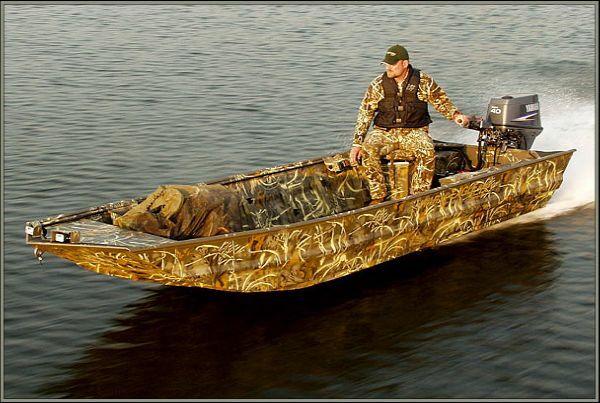 This Official DUCKS UNLIMITED Edition model from War Eagle Boats, the 648 LDV DU Edition Duck Boat. This War Eagle 648 LDV (Ducks Unlimited Edition) is the perfect hunting & fishing rig for even the most frugal Duck Hunter!. 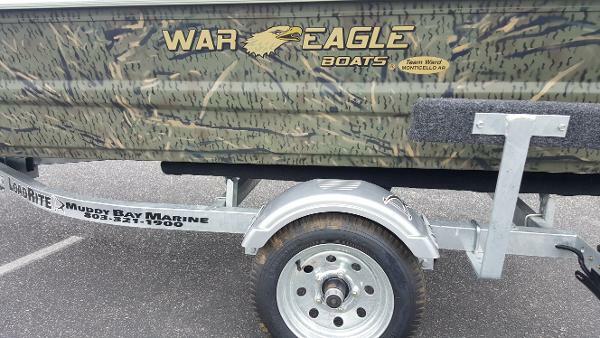 *** This War Eagle 648 LDV Ducks Unlimited Edition is LOADED, T O U G H and ready for action: War Eagle 648 LDV Duck Boat * Full RealTree Max-4 Camo Package * Duckbill Option with 4 LED Rainbow Lights * Linex Spray-in Liner * Treadplate floor * Gunnels with T-rail System * Front deck storage * Hinged-rear lid / fuel tank cover * Rear SeatTrack Adapter * Front Deck Seat Base * Full center keel * All Welded Construction * Pressure-injected foam flotation * Official D U C K S U N L I M I T E D Edition * Marine Light Package Ready for your choice of power from Yamaha, Honda, Mercury, Evinrude, or Tohatsu outboard, OR Pro-Drive, Gator-Tail, Boss Drive, or Mud Buddy Mud Motor! * Outboard or Mud Propeller * Interstate Marine Battery * And so much more! This is one T O U G H Boat! Just add freight, prep., and rigging, and get one one of the best deals on the water. This deal is hard to beat. *** On the spot financing with rates as low as 2.99% APR for up to 180 months (wac). *** Muddy Bay Marine is your Southeastern Hunting & Fishing Boat Headquarters. Get your custom War Eagle, Xpress, Excel F4 and F86, DuraCraft, Pro Drive, Gator Tail, Gator Trax, Havoc, Alweld, StarCraft, Starweld, Sea Ark, Mi-Tide, Triton, Veranda Pontoon, Sylvan Pontoon, Sun Chaser Pontoon, or StarCraft Pontoon and be on the water TODAY! 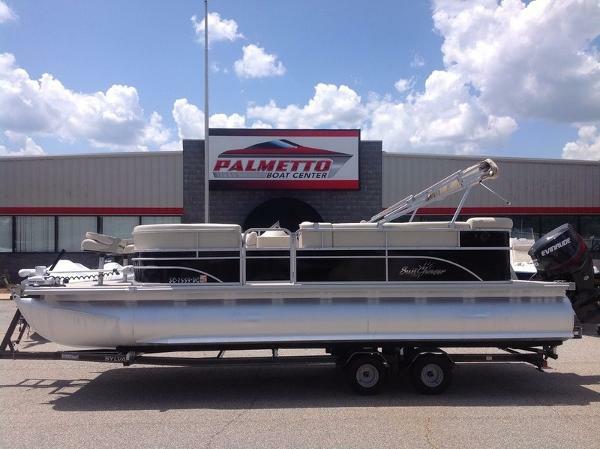 Muddy Bay Marine is a large stocking marine dealer located here in Newberry, SC with over 135+ hunting and fishing boats in inventory, in all the different models. * * Also, keep in mind that Muddy Bay Marine GUARANTEES the Lowest Price on all our lines of Boats. * * I will be happy to answer any questions about pricing, features, options or helping you find the best boat that suits what you are looking for and get you on the water with no waiting and in-house financing. I hope you will let me earn business and show you the best service available!. GUARANTEED LOWEST PRICES ON ALL WAR EAGLE BOATS! 2016 War Eagle 754LDV w/ Alum Trailer 2016 War Eagle 754 LDV Max-4 Duck Boat War Eagle 754 LDV Duck Boat, the Official Boat of DUCKS UNLIMITED! This Official DUCKS UNLIMITED Edition model from War Eagle Boats, the 754 LDV DU Edition Duck Boat. F.A.S.T. and Dependable! 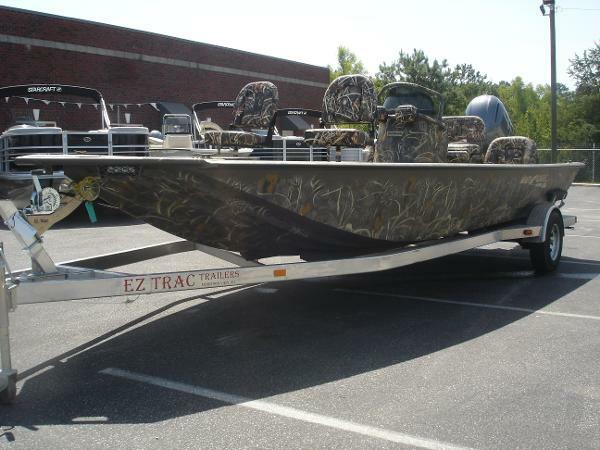 This War Eagle 754 LDV (Ducks Unlimited Edition) is the perfect hunting & fishing rig for even the most frugal Duck Hunter and INCLUDES a custom Muddy Bay Edition EZ Trac Diamondplate Aluminum Drive-on Trailer! This War Eagle 754 LDV Ducks Unlimited Edition is LOADED, T O U G H and ready for action: * Full RealTree Max-4 Camo Package * Duckbill Option with 4 LED Rainbow Lights * “V” Bow for Timber Hunting * Winged Transom for quick turns * 12/24V Trolling Motor Kit * Navigational Light Package * Linex Spray-in Liner * Treadplate floor * Drop Deck * HD Gunnels with T-rail System * Full Floored Fuel Tank Compartment * Hinged-rear lid / fuel tank cover * Rear SeatTrack Adapter * Front Deck Seat Base * Rear Deck Seat Base * Full center keel * All Welded Construction * CG approved Level foam flotation * Official D U C K S U N L I M I T E D Edition Custom ALUMINUM Drive-on Trailer * Side Guide Package * Marine Light Package * HD Wheel Fenders *Blackout Mag Wheel Package * Aluminum Rims This is one T O U G H Boat! Just add freight, prep., and rigging, and get one of the best deals on the water. This deal is hard to beat. *** On the spot financing with rates as low as 2.99% APR for up to 180 months (wac). *** Muddy Bay Marine is your Southeastern Hunting & Fishing Boat Headquarters. Get your custom War Eagle, Xpress, Excel F4 and F86, DuraCraft, Pro Drive, Gator Tail, Gator Trax, Havoc, Alweld, StarCraft, Starweld, Sea Ark, Mi-Tide, Triton, Veranda Pontoon, Sylvan Pontoon, Sun Chaser Pontoon, or StarCraft Pontoon and be on the water TODAY! Also, keep in mind that Muddy Bay Marine GUARANTEES the Lowest Price on all our lines of Boats. 2016 Excel 1751 Viper F4 Excel Viper F4 Max-4 with 60hp YAMAHA The NEW Excel 1751 Viper F4 in Real Tree Max-4 Camo with the Yamaha EFI 60hp 4-stroke. F.A.S.T. and Dependable! This Excel Viper F4 Real Tree Max-4 Edition is LOADED, T O U G H and ready for action. *** Excel 1751 Viper F4 * Real Tree Max-4 Camo Package * Max-4 Camo Linex Spray-in Liner * Full Skin-out with floor and sides * Full F4 Hunt Deck * Patented Kik-Up Transom * Full Hunt Deck * (2) Interior LED Light Kit (White and Amber) * Trolling Motor Kit with Switch (wiring harness, plug, switch) * 11 Gallon Built-in Fuel Tank under Bow (for better weight distribution) * Fuel Gauge in Rear EIP Deck * Accessory Panel with Rocker Switches * 800 GPH Bilge Pump * Built-in Gun & Rod Box * Shell Tray * (2) Dry Boxes (insulated) * Excel Embroidered Tempress Seat in Max-4 Camo * Twin LED Front Spot Lights * Bow Cap Tie Bracket * Longitudinal Rib Construction * EXceleration Hull Design (runs very fast and very shallow) * Pressure Injected Level Foam Flotation * HD Gunnels with T-Rail System * Bow Rails * EIP Rear Deck * 12v Outlet Heavy Duty Hybrid Rake * Front Deck Storage Net * 11 Gallon Built-in Fuel Tank in Front Bow * Running Light Package * "V" Bow for Timber Hunting * (2) 3' Bow Rails Custom Muddy Bay Edition EZ Trac Diamondplate Aluminum Trailer * Full Side Guide Package * Diamondplate Aluminum Rear Steps * Diamonpldate Aluminum Fenders * Blackout Mag Wheel Package Yamaha EFI 60hp 4-Stroke * Yamaha Propeller * Interstate Marine Battery * And so much more! This is one T O U G H Boat! *** On the spot financing with rates as low as 2.99% APR for up to 180 months (wac). *** Muddy Bay Marine is your Southeastern Hunting & Fishing Boat Headquarters. Get your custom War Eagle, Xpress, Excel F4 and F86, DuraCraft, Pro Drive, Gator Tail, Gator Trax, Havoc, Alweld, StarCraft, Starweld, Sea Ark, Mi-Tide, Triton, Veranda Pontoon, Sylvan Pontoon, Sun Chaser Pontoon, or StarCraft Pontoon and be on the water TODAY! Muddy Bay Marine is a large stocking marine dealer located here in Newberry, SC with over 135+ hunting and fishing boats in inventory, in all the different models. * * Also, keep in mind that Muddy Bay Marine GUARANTEES the Lowest Price on all our lines of Boats. * * I will be happy to answer any questions about pricing, features, options or helping you find the best boat that suits what you are looking for and get you on the water with no waiting and in-house financing. I hope you will let me earn business and show you the best service available!.